Do you need to send email newsletters to all registered users in WordPress? This one feature could be really handy and help you reach out to most of the loyal users who are connected to your brand. One solution to send email to users in WordPress is by exporting the list of users, importing it to email services like Convertkit, Aweber or similar and then sending a newsletter. However, there are better solutions now where you can send emails to all users in WordPress from the dashboard itself. There are two free plugins available for this, and I’m listing both of them below. These plugins use the WordPress mail function to send the email newsletters. If you have a large number of users, which may be in the case of WooCommerce or Easy digital download enabled WordPress site, you should use SMTP services like Sendgrid, Amazon or any other. If this sounds technical to you, do consult your developer. For a small list of users, you don’t have to get into mumble-jumble of configuring SMTP services. In fact, in this scenario, you don’t need to configure anything to start sending email newsletters to users. This is the first WordPress plugin that I would recommend for sending emails to all registered users in WordPress. SMTP-ready: Choose to send mail by SMTP or PHP’s mail() function. Send with your web host, Gmail, any SMTP, like SendGrid, Amazon SES Mandrill, etc. The default template is included as an HTML file in the plugin folder; feel free to edit. Easy-to-use. It just works out of the box! With the help of multi SMTP feature, you can send unlimited emails from your WordPress dashboard. 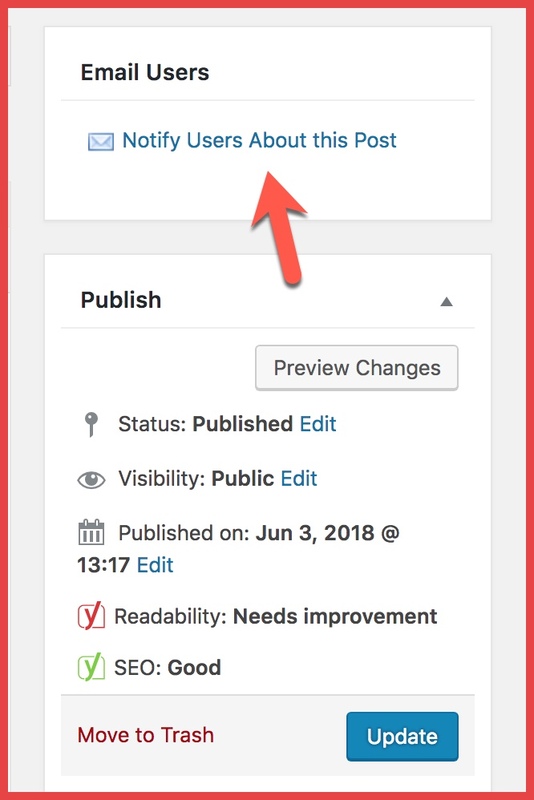 The plugin offers an auto-responder feature that you can use to automatically notify users about the newly published blog post on your blog. I like the feature that helps send an email newsletter to individual user or role or to a list. You can import any existing email list and send email newsletter using the plugin. Tip: Use this plugin to export the email address of all commentators on your blog. Email users is a lighter plugin than the one above. 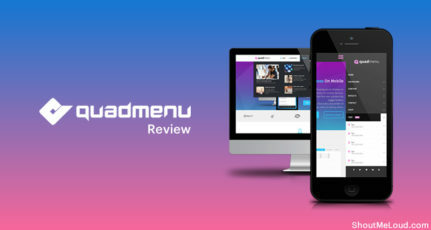 This plugin offers you minimal option and you can send email newsletter to registered users. You can send email newsletter to an individual or a group of users. You can control who will receive and who will not receive an email. You can write a custom email in HTML format. You can click on any post and send that post to your list. You can also use it as a way to send email newsletters to your registered blog readers. Sending an email newsletter with a link to your best post from the last month is a great idea. For an affiliate marketer, this plugin can be used to send monthly discount coupons. I can think of a thousand different ways that you can use this plugin. But in order to make the most out of it, you need to think out of the box. This plugin has enormous potential and can be used for many purposes. I would love to know your thoughts. How would you use this plugin? To how many users we can send emails using this plugin? If i want to send emails to 1000K users then is there any feature like this? The plugin is really interesting. nice plugin… i too going to offer guest blogging in my blog… this will be helpful after that…..
Great, this will be very helpful!! I will be much easier to reach or spread the news I would like to send to guest bloggers. Anyone else find that it doesn’t email to more than 10 users when you select a group to email to? It looks a good plugin and does what it says. But what I’m concerned is the server load. Will it be suitable to send emails for a few thousands users when my blog is hosted on HostGator baby plan? I was searching Google for a plugin like this. I thought I would have to import all the addresses into a bulk email software. Glad I found this. I use this plugin. This plugin is useful to send an email to all guest blog account holders on my website. Guest Blog account holders do not subscribe to blog. 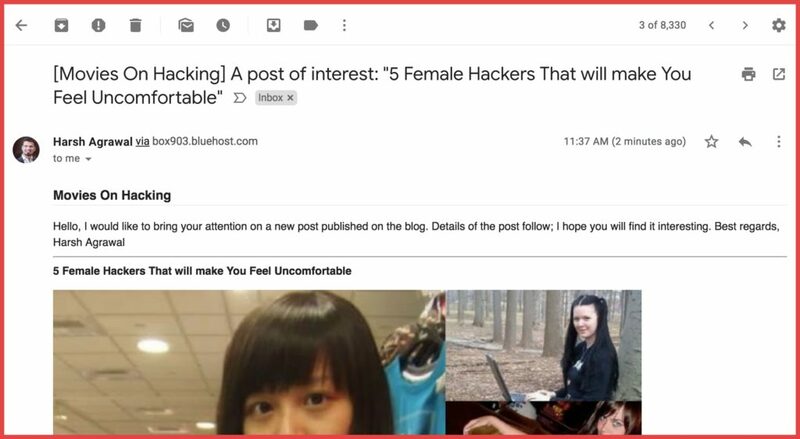 If I use this plugin to send an email to them, and by chance, they share it on social media, it is a great value addition to the blog post.